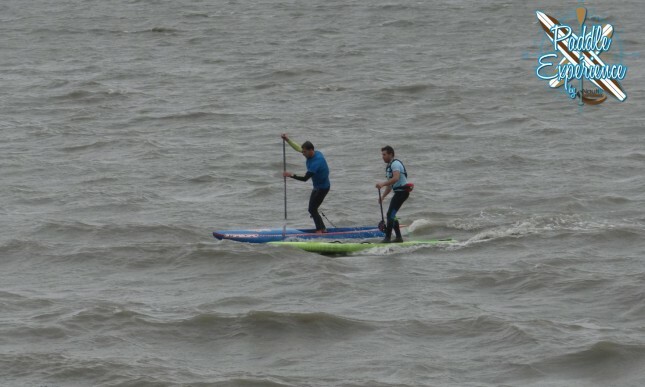 Greg Closier has taken out the Raid Paddle Race in France on the weekend, as six dozen paddlers enjoyed a wild and woolly 10km downwinder across the Gulf of Morbihan. With a stiff breeze providing plenty of bumps and an overcast sky forcing paddlers to wear plenty of neoprene, the race for the prize was super tight. Greg and his fellow French paddling stalwart, Gaetan Sene, sprinted up the beach to the line after catching bumps side by side over the final kilometre. Third was another old schooler in Yoann Cornelis, while Joseph Gueguen and Martin Vitry had just one second separating them in the fight for fourth. Joseph backed it up by claiming victory in the smaller, BOP-style “Beach Race” event ahead of Gaetan. France’s five top ranked paddlers were missing on the weekend (Eric, Titou, Martin and the Arthurs), however the performances at Morbihan highlight just how deep the talent runs in the land of cheese and baguettes. Good to see so many paddlers out on the water despite what was clearly some very cold water. In the women’s downwinder, Amandine Chazot crossed the line first in 1 hour 6 minutes, a couple of minutes in front of Solange Pruvost. Here’s a short highlights reel that shows off the conditions pretty well, then we’ve got full results down below that. More photos and plenty of French-language coverage on Get Up SUP Mag, SUPmag.fr, Surfing France.